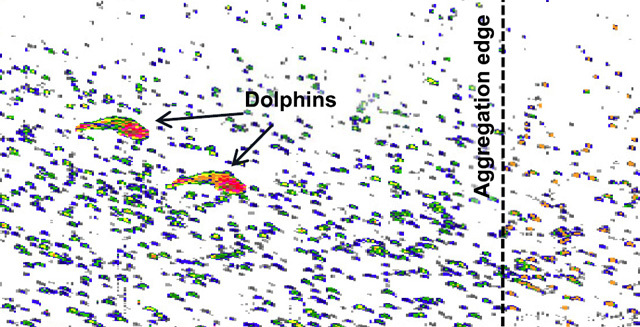 Although acoustics allow us to “see” large areas of the ocean, without additional forms of observation it can be difficult to identify unique acoustic signatures. 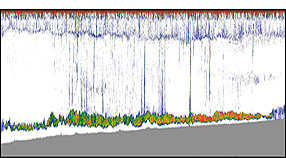 One project the Acoustical Ocean Ecology Group is working on is matching acoustic signatures to animals by cataloging the signatures of organisms directly observed by the ROV Ventana’s camera. This is more effective than bringing pelagic organisms like fish, squid, and gelatinous creatures to the surface for analysis, as environmental and pressure changes often lower the quality of acoustic samples. By improving our catalog of known signatures and discovering patterns, we can begin to use acoustics to get a much higher resolution of understanding of large areas of the ocean.